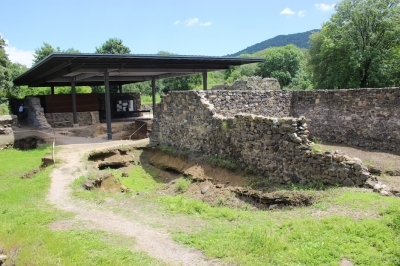 Dmanisi Hominid Archaeological Site is part of the Tentative list of Georgia in order to qualify for inclusion in the World Heritage List. Dmanisi site shows the remains of a prominent Middle Age town from the IX-X centuries. In 1983, while excavating the ruins of the medieval settlement, archeologists found animal fossils in sediments exposed in the medieval cellars, dating from about 1.5 millions years. Subsequent excavation yieled stone tools in 1984, and then remains of at least 5 hominid individuals between 1991 and 2005, dating frome 1.8 millions years. Those remains span different developmental stage (subadult, adult and an old adult). The mandibule and cranium of the old adult shows it lived several years without teeth, raising questions about the social structure of early homo species. Surviving without teeth hypothesized an early from of assistance and care from other individuals. Discoveries of those homo remains have reopened the debate about the first human dispersal from Africa. Those hominids are the earliest dispersal beyond Africa. They exhibit numerous archaic physical charcteristics of early Afrianc hominids, but also share certain similarities with later Homo erectus. The site is 85 km south-west from Tbilissi, with good roads all the way. It is easy to find. The site is rather low-key. It is on a promontary created by the confluence of two rivers. Walls of the middle-age fortress are prominent. Inside the fortress, we find three nice churches, dating from the 6th to 9th centuries. The day of my visit, the site was full of Georgian schoolchildren, and the priest as happy to open the main chruch to visitors. The site of the hominids discovery is rather small, with excavations left open, a roof built to protect them. The information tables are well done and explain the importance of this site. They is an entrance fee of 3 GEL (1euro). Even of low key, this site is worth a visit, even if it is probably not top of the list of day-trip from Tbilissi. In my opinion, its has a OUV and a good chance to be WHS one day.